If Youtube is the new television, podcasts are the new radio. Just like radio broadcasting back in the day, having a podcast today will multiply your influence faster and more effectively than ever before. Whether we like it or not, online audiences are reading less and less. Long form articles have been replaced by 140 characters or less. Very few people (if any) read 3,000 word articles word-for-word. Online written content is filled with distractions. Sidebars, ads, popups, and images mean your audience members are constantly distracted from the text that you have spent so much time writing. Youtube videos are even worse; not only do you have to deal with ads, but when the video ends you find yourself watching something completely unrelated to what you started out with. But when it comes to podcasts, your audience can focus on the sound of your voice. That means they receive the information that you are trying to deliver to them far more efficiently than if you used any other medium. It is easier for audiences to listen to podcasts than it is for them to watch videos or read articles. Your audience can listen to your show while they run errands, work out, drive, or do office work. The same cant be said about reading articles or watching Youtube videos. Podcasts are also more accessible to audiences whose reading skills may not match your writing style. In fact, studies show the vast majority of Americans read at a third grade level of proficiency. With voice assistants like Siri, Alexa, and Cortana, voice content will become increasingly more important. Its only a matter of time before these voice assistants start searching for and playing voice content directly from podcasters. And with the rise of connected cars, the demand and consumption of podcasts will explode. This is already happening. By starting a podcast now, you are positioning yourself ahead of the curve. …and dozens of other politicians, millionaires, and spiritual scientists that I would have otherwise never had the opportunity to interact with. These interviews set me and my brand apart from other competitors who chose to only do videos or write articles. And when you sit across from experts, the audience holds you in the same high level of regard as those you interview. 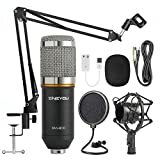 If you are ready to get serious about starting a Black podcast, there are three things you will need in order: a plan, a microphone, and some software to edit your recordings. 3. Listeners feel like the show is chaos. All three of these factors can be mitigated with a podcast blueprint. Your blueprint consists of your publishing schedule, a pre-planned list of episode topics, and a “format” for your shows to follow. When it comes to podcasting, consistency is key. Some podcasters are able to drop episodes every day, while others stick to a weekly or bi-weekly schedule. How often you decide to drop new episodes is entirely up to you, but anything less than bi-weekly might be too little to keep your audience engaged. When it comes to your publishing schedule, the one piece of advice I can give you is this: do not try to discipline yourself to stick to a schedule. That’s right – do not try to discipline yourself to stick to that schedule! Discipline and willpower are both myths that psychologists have debunked for years. Discipline fails. Life gets in the way. You may have a busy week or a noisy house that makes recording impossible. And sometimes you just don’t feel like recording. To avoid all these potential issues throwing you off your schedule, take my advice: record as many episodes of your podcast as possible ahead of time, and then schedule them to publish for as far out in the future as possible. If you use WordPress to run your website, there is a scheduling feature built in to the system. Same thing with Libsyn – a popular podcast hosting platform. With 5 or 10 episodes ready to go before you even launch, you will have much more space and flexibility to record and add new episodes in the future. Knowing how often you are going to publish doesnt mean much if you have nothing to talk about. I mentioned earlier that one of the biggest reasons that podcasts fail is that the host runs out of topics to discuss. First, set a timer for about 30 minutes. There is a saying that goes work will fill the time you give it. Having a time constraint will prevent you from spending all day doing this, and will also make you more creative. Finally, brainstorm questions that are relevant and interesting to both you and your audience and write those down next to each number. Who are you? How did you get started? This should be your first podcast episode because people love origin stories, and it gives you an opportunity to introduce yourself to your audience. Who are the thought leaders in your field? These leaders can be authors, bloggers, community activists, Youtubers, other podcasters, or educators. You can either invite these personalities as interviewees or do episodes based on their books, videos, podcasts, and teachings. What does success look like for members of your audience? How do they get there? In our example of a Black parenting podcast, what makes a Black parent successful? What are members of your audience passionate about? What are the biggest challenges that members of your audience face? What frustrates them? And how do they overcome these issues? Each of the above questions can be turned into an episode on their own. Brainstorming the questions that matter most to your audience ensures you will never run out of things to talk about! When are the best times to do certain things relevant to your audience? When should members of your audience transition from one stage to another? How do they manage that transition? Why episodes should give your listeners a look behind the scenes of why something may or may not be a good idea, why something is the way it is, or the thought process behind certain behaviors. These questions should help your audience understand how something is done or how to achieve specific results. For instance, the Black Entrepreneur Blueprint dropped an episode titled How To Make Money In The 7 Trillion Dollar Travel Business With Your Own Local Tour Business. More relevant to our Black parenting podcast, an episode can be “How To Tire Out Your Toddler Without Wearing Yourself Out”. Now you have 56 different topics – and 56 different episodes – that will ensure you dont run out of things to talk about for at least a year. And it only took you 30 minutes! This guarantees you are never at a loss for topics. If you do not feel confident discussing topics because you are not a subject matter expert, reach out to influencers who are and interview them on your podcast. The format you choose is completely up to you, but whatever format you decide on make sure you stick to it. Most amateur podcasts sound like the host just turned on the mic and started rambling without any discipline to their conversation. Having a format will help you avoid making the same mistake – and your audience will appreciate it! Your audience will judge the quality of your podcast on the quality of the sound of your voice. There is nothing worse than suffering through a podcast that sounds like someone recorded it on a payphone. 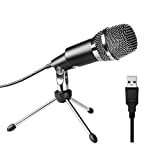 I cant emphasize this enough: a good microphone is the most important investment you can make! No matter how much editing you do, nothing can fix the sound of a low quality microphone. 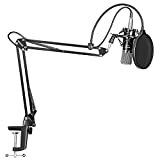 Your microphone doesn’t have to be expensive, but it has to be a quality piece of equipment. The microphones below are best sellers for a reason. All of these microphones plug right into your laptop USB port and allow you to block out background noise. I have personally been using #2 for the past few years, but check out the other 5 before you make your final choice. 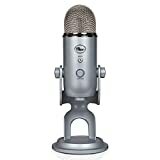 Now that you have completed your planning, and you have a decent microphone, its time to get some software to edit your podcast. If you have a Mac, you already have GarageBand. If you have a PC you can download Audacity here for free. The two suggestions are probably all the software you’ll need. Both are easy to use, and dont need too much out of the box meddling. There are also more Youtube tutorials on how to use these programs than you will ever need. Later on you may decide to buy more advanced software, but I am telling you that you dont need to. The free versions out there are all you need. 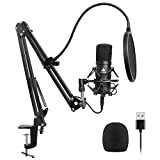 That’s it – you are ready to enter the world of podcasting! If you need ideas for your niche or have questions about how to get started, leave them in the comments below. Or, if you are a Black podcaster, tell us where we can find your podcast in the comments below! One area to cover should be how to record distant guest using Skype or Zoom, and how to set their voice levels. Or worse, conduct the entire show, only to find out, the guest audio wasn’t recognized. You are on point with your comments! I have recorded a few episodes and found out that none of it was captured. I have also spent hours setting up Skype and still struggling. I will be doing a followup to this post with tips on how you can address both these issues. Thanks for the comment, Family!